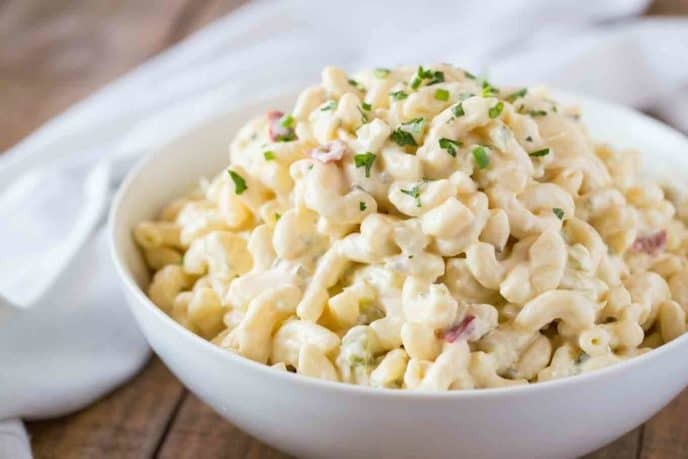 Classic Macaroni salad is an easy side dish you can make the night before your next picnic or potluck with an easy creamy and tangy classic dressing. 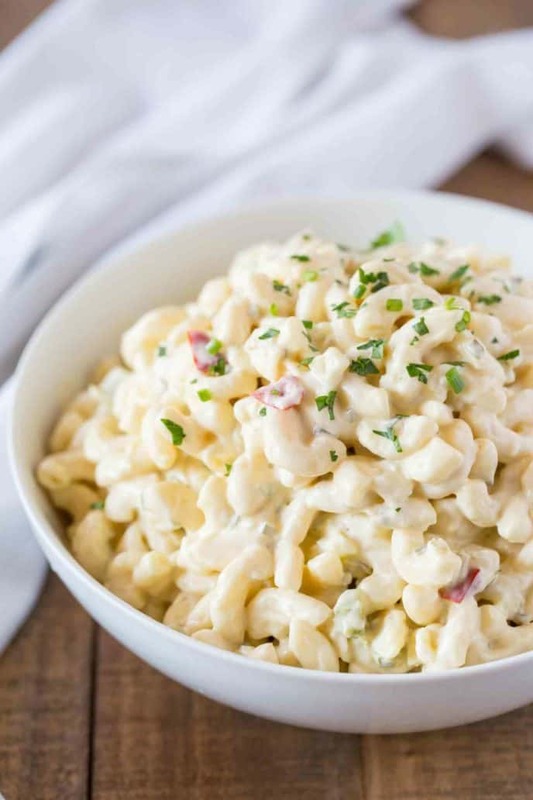 Macaroni Salad is the classic popular summer side dish we all grew up eating. 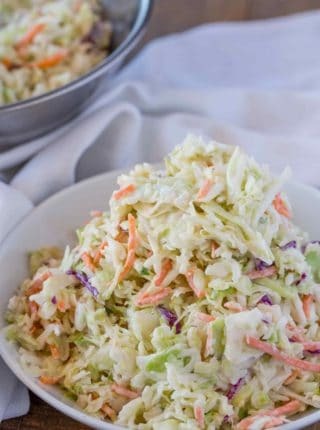 We love bbq’s and picnics serving this along with Cole Slaw, Baked Beans and Baked Mac and Cheese for the ultimate spread. 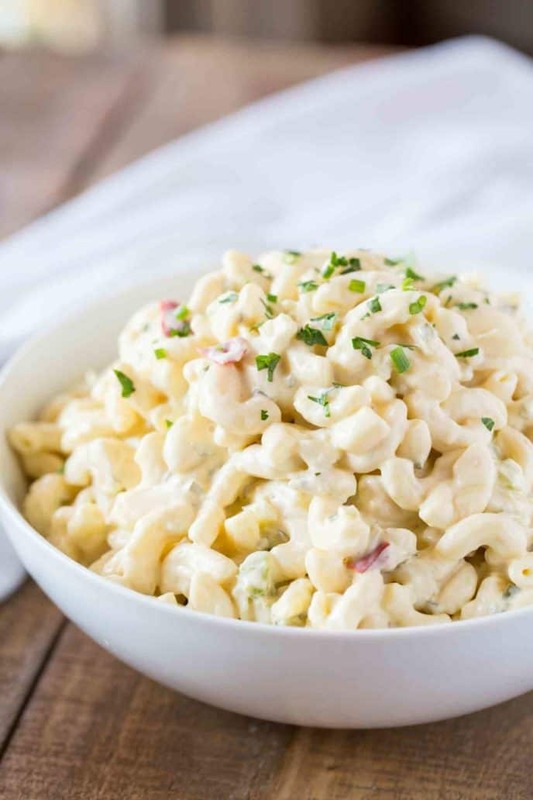 Easy Macaroni Salad may seem like a silly recipe since most people tend to go to the grocery store deli and load up on sides (like Pea Salad and Crab Salad too!) in preparation for big parties. But pasta salad can be so easy it won’t even be worth the grocery store trip. 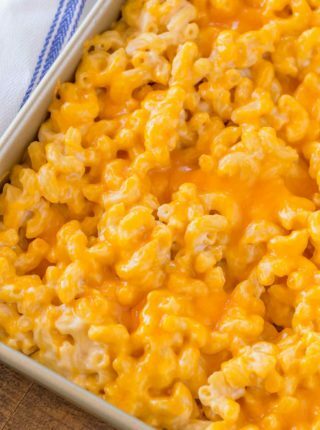 How do you make Macaroni Salad? Macaroni salad is an easy pasta salad that’s a mix of elbow pasta, mayonnaise, vinegar, sugar, relish, mustard and pimento peppers. But, here’s the thing. This recipe is crazy easy. So easy in fact by the time the pasta is done cooking you’ll have the entire mixture ready to go. Then you drain the pasta, toss it in the mixture and refrigerate overnight. The longest part of the recipe? Waiting for the water to boil. Peas: People LOVE peas in their pasta salad salads, just toss in frozen peas, they’ll thaw out overnight without any issues. Ham: Diced ham is also really popular especially in a Hawaiian version which also has pineapple in it. Red Onions: They’re slightly sweeter than yellow onions and add a fun color. Bell Peppers: Don’t worry they’ll have a slight crunch but also somewhat soften overnight. Tuna: Tuna Macaroni Salad is hugely popular and a perfect easy picnic main dish option since you’re adding a protein. Eggs: Chopped eggs are and easy and very popular mix-in I sometimes use too. Use 3-4 large eggs that have been hard boiled. Pickle Juice: If vinegar is too harsh a flavor for you, try substituting pickle juice! Cheese: Cubed bits of cheddar cheese added to your salad is an easy protein addition. Noodles: Yes noodles, feel free to swap out the pasta shapes. Sometimes I use rotini or ziti or even broken spaghetti! One of my kid’s favorite options is when I make a Rainbow Macaroni Salad for them. I add in red bell peppers, orange bell peppers, yellow bell peppers, green bell peppers and red onions for an easy, vegetable filled rainbow. Another fun option is Hawaiian Macaroni Salad which has grated onions, pineapple, carrot and sometimes cubed ham for a tropic twist. This is generally served along side steamed rice and classic Hawaiian bbq meats. Pasta Salad is sort of the king of cold summer sides. Because the pasta is so filling and easy and great at room temperature we find ourselves trying out all different pasta salad recipes. 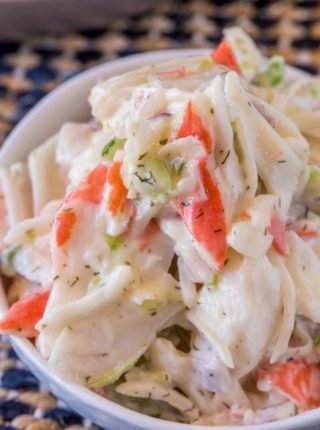 Macaroni Salad is often made for large parties. A good rule of thumb is about 1/2 a cup or about 5 ounces per person. What do you eat macaroni salad with? 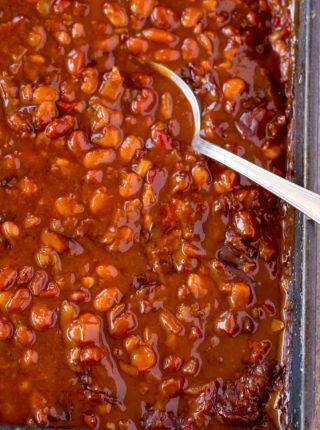 We love serving Pulled Pork, Pulled Chicken or Fried Chicken alongside other easy side dishes like Three Bean Salad. Mix all the ingredients together (except the cooked pasta) in a large bowl then add in the pasta, coat well and refrigerate overnight. Just what I have been searching for. Made per recipe, and very pleased. I made this and now it’s in the fridge awaiting lunch tomorrow. I had corned beef I needed to use, so in it went. I cubed some cheese and added that too. Your recipe is versatile and the sauce is very tasty. Not boring! Can’t wait to have some! I want to try this recipe for the first time…can you tell me the most important ingredients and steps I should not miss. Just follow the recipe card step by step and you’ll be set. Enjoy! I’ve been eating macaroni salad all my life and have NEVER had it with onions….doesn’t even sound right to me. Thank you for posting the only recipe on the internet that doesn’t have them in it. It’s the one I’m going with! Yay!! So glad you found it! You’re welcome! It’s fun trying new dishes. Way too sweet, I think if I were to attempt this recipe again, I’d either forego the sugar or the sweet relish to balance it out. Other than that it wasn’t too bad. This recipe was a hit with a group of pilots at an air force function! We doubled the recipe and still, the bowl was completely cleaned-out. Not one morsel left. Days later, I had calls from some of the wives asking for the recipe as their husbands kept raving about it. The addition of the relish was a wonderful taste enhancer. I referred them to your website. Thank you for your terrific recipes! Yay!! So glad everyone enjoyed it! I look forward to trying this Macaroni salad, im so very busy, I usually don’t have time to cook. Our church usually has great potluck dinners. The ladies at our church usually make homemade dishes, most are retired. I needed something I could make in short time. Thanks for the recipes. I made this recipe and loved it! I totally LOVE Macaroni Salad, and have probably made it every which way possible over the years. We also love it w/small shrimp, celery, diced red onion, & plenty of fresh dill. I like using a (70-30%) blend of real mayo & sour cream for the dressing when I make it this way (so refreshing on a hot summer day.) Your Macaroni Salad recipe is perfect as written, and I also like all of the optional ingredients which you listed. The possibilities are endless. Thanks for posting this amazing recipe! Oh my gosh, I love a good macaroni salad recipe and this one looks like a keeper! I love the idea of rainbow macaroni salad! Such a fun way to get kids excited about eating vegetables. Rainbows are always a great go-to for my kids! 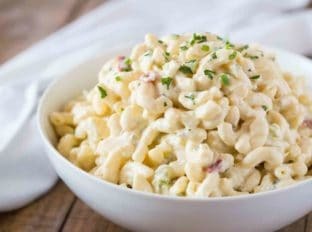 I haven’t made this yet but i love macaroni salad. I will be giving this a try. I made the pea salad and loved it. thank you for all the wonderful recipes. I could eat this salad every day! And I love the addition of sweet relish! Don’t rinse your pasta. Otherwise the sauce, even marinara, will not stick.